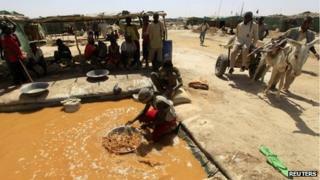 More than 100 people are feared to have died in a well collapse at a gold mine in Sudan's Darfur region on Monday. The number has risen from the toll of 60 estimated by local officials earlier in the week. Some rescuers were reported to have become trapped, while officials voiced fears that more wells could collapse. Rival groups in North Darfur fought for control of the mine in February. Gold has become a key commodity for Sudan since the oil-rich south seceded. The split, nearly two years ago, led to Sudan losing about 75% of its oil production. The government hopes to produce around 50 tonnes of gold in 2013, which could make Sudan Africa's third-largest gold miner and push it into the top 15 producers globally, Reuters news agency reports. The 40m (131ft) deep well at the Jebel Amir mine in North Darfur caved in on Monday. Jebel Amir local commissioner Haroun al-Hassan on Thursday put the death toll at 60. But on Friday, he told the BBC that an official toll was not yet known. Local witnesses have said they think the death toll could reach more than 100. One miner told news agency AFP: "According to a count by people working in the mine, the number of people inside is more than 100." The same miner, who asked to remain anonymous, said that nine members of the rescue team "disappeared when the land collapsed around them" on Thursday. Mr Hassan had said that rescuers were having to use traditional tools amid fears that more wells could cave in. "We cannot use machines because if they came near, the ground will collapse," he was quoted as saying on Thursday. "People are using traditional tools and because of this, the rescue is very slow." Some 100,000 people fled fighting after rival Arab groups fought for control of the mine in February, the UN said at the time. More than a million people have been living in camps for the displaced in Darfur, after a decade of fighting. Violence in Darfur has come down from its peak after civil war broke out in 2003 but there are still clashes between government forces, rebels, bandits and rival ethnic groups.